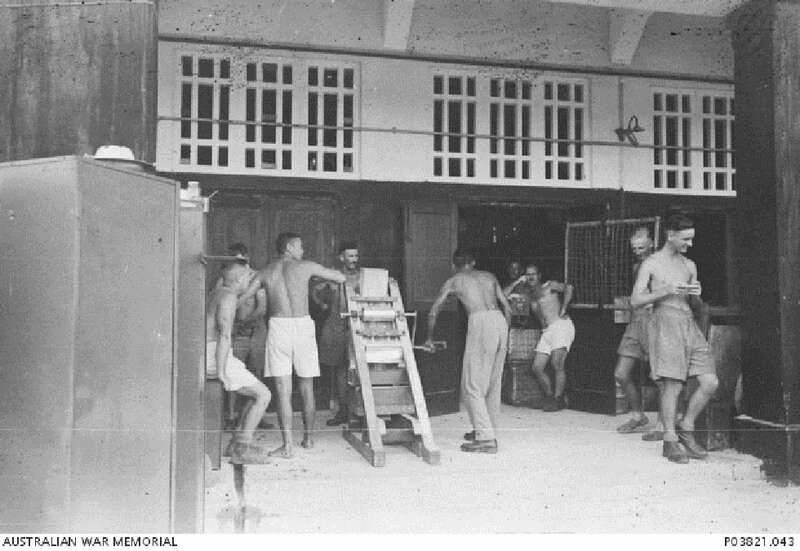 POWs operate a hand mill to grind raw rice into flour, on the verandah of a Selarang Barracks building. The mill was designed in the Changi POW Camp and the rice flour used in the cooking of "doovers", which were dishes such as rissoles and pancakes created in an attempt to disguise the monotony of rice, 1942. Image courtesy of Kennedy B Burnside, Australian War Memorial. The accused beat, tortured and maltreated three civilians of the Andaman and Nicobar Islands in two separate incidents. At the time of the alleged offences, the accused was in charge of overseeing local land farmers working for the Japanese at Port Blair. The victim of the first offence was a farmer, beaten by the accused because he was too sick to work that day. The beating, described as savage and ferocious, coupled with the accused’s pouring of hot water over the victim, resulted in fatal injuries and the victim's eventual death. The victims of the second offence were an aged farmer couple, beaten because they had protested the accused’s taking of their rice stock. Unusual for cases before this war crimes court, the JAG advised a great reduction in the accused's sentence. This was so because the JAG was of the opinion that the court had erred in its findings. Komaba, Kanekechi. Employed in the Construction Department of the Imperial Japanese Navy Civil Administration (Minseibu). Civilian. From Japan. Guilty. Life imprisonment. Sentence reduced. 10 years' imprisonment. Lala, G.C. Captain. Indian Advocate.